For the current Libyan armed forces, see Libyan National Army. The National Liberation Army (Arabic: جيش التحرير الوطني الليبي‎ jaysh al-taḥrīr al-waṭanī al-lībī), formerly known as the Free Libyan Army, was a Libyan military organisation affiliated with the National Transitional Council, which was constituted during the Libyan Civil War by defected military members and civilian volunteers, in order to engage in battle against both remaining members of the Libyan Armed Forces and paramilitia loyal to the rule of Muammar Gaddafi. It had prepared for some time in portions of Eastern Libya controlled by the anti-Gaddafi forces for eventual full-on combat in Western Libya against pro-Gaddafi militants, training many men before beginning to go on the offensive. They have battled for control of Benghazi, Misrata, Brega, Ajdabiya, Zawiya and Ra's Lanuf as well as several towns in the Nafusa Mountains. They finally began the Battle for Tripoli in August 2011 when they attacked from the west of the city, as well as fomenting an internal uprising on 20 August. There were claims that there were 8,000 soldiers in Benghazi equipped with a substantial number of weapons captured from abandoned Libyan army depots, including AK-47 and FN FAL rifles, RPGs, SPGs, anti-aircraft guns and several tanks. The force was formerly named the Free Libyan Army, but it was changed at the end of May 2011 to "help better define the increasingly professional and disciplined military efforts to overcome the Gaddafi regime", according to a statement released by the National Transitional Council. It uses the tricolour flag first adopted by Libya in 1951, which has become emblematic of the Libyan Republic and the revolt against Gaddafi; considering that the flag is the same sign of Libya's independence and freedom from the Italian occupation. The NLA finally succeeded in defeating the last pro-Gaddafi remnants on 20 October 2011, during heavy fighting in Sirte, and captured Muammar Gaddafi himself, who later died of bullet wounds after his capture, effectively ending the Libyan civil war. The current status of the organisation following the Libyan provisional government's "declaration of liberation" is unclear. As of November 2011, the National Transitional Council is in the process of restructuring the army, with military personnel who defected from the Gaddafi regime and former rebel fighters of the National Liberation Army forming the basis is the new Libyan National Army. Major General Khalifa Belgacem Haftar was chosen as the overall commander of the new Libyan Army due to his military experience and loyalty to the revolution that overthrew Gaddafi. The Libyan Army only numbered "a few thousand" trained soldiers in November 2011, and was rapidly trying to train up new fighters who could keep the peace nationwide and deter rogue militias from acting without NTC orders, and was responsible for brokering a ceasefire on at least one occasion in November between warring militas from Zawiya and Al Maya. On 1 December 2011, it was reported that the National Liberation Army was to integrate up to 50,000 former rebel fighters into the new Libyan national army and police forces, with the aid of French training, with long term aims to integrate as many as 200,000 fighters from the brigades that had fought against Gaddafi during the civil war. In December 2011, Turkey agreed to provide training the Libyan Army as it attempted to reorganize in the aftermath of the civil war. Also in December, large numbers of former rebels were being given jobs in the new army, whilst the government also announced that they would be free to join the special forces and the navy too. According to Osama al-Juwali, the defense minister: "The idea is to inject new blood in the army which was marginalized by the tyrant (Gaddafi)"
General Yousef Mangoush said on 5 January 2012 that Libya's new army faces major obstacles such as rebuilding bases destroyed during the conflict, as well as disarming militas that were not part of the new army. National Army commander General Khalifa Hifter said later that it could take between three and five years for Libya to field a capable enough army to protect its borders. No reliable estimate on the total strength of the Army exists. Training camps are being organized in Benghazi, Bayda and Ajdabiya attended by "thousands of men" according to a report of 3 to 6 March. The opposition force taking Brega and Ra's Lanuf during an advance of 2–4 March was estimated as numbering between 500 and 1,000 men. In the Nafusa Mountains alone there are up to 2,000 rebel fighters. After being driven back to the outskirts of Benghazi, the Free Libyan Army took the offensive once more on 25 March. In a string of victories the rebels retook the cities of Ajdabiya, Brega, Ra's Lanuf and Bin Jawad and were advancing to Sirte. However, after being in position for 48 hours, they were forced to withdraw from Bin Jawad and Ra's Lanuf again. The front line was than in the region of Brega and Ajdabiya for several months, with additional front lines in Misrata and the Nafusa Mountains. In late August Rebels in the east were finally able to retake Brega and several other cities closing in on Sirte. At the same time rebels in Misrata were able to push out of the city and secured all surrounding towns, and rebels in the Nafusa Mountains were able to take most of the western coastline including Tripoli itself. Each soldier has also been given an ID card with photo, name, brigade-name, and their blood type. These ID cards are either in the form of paper in plastic slips or plastic cards. Obaida Ibn Jarrah Brigade – Islamic extremist militia allegedly implicated in the assassination of National Liberation Army commander-in-chief Abdul Fatah Younis on 28 July 2011. Okbah Ibn Nafih Brigade – Islamic extremist militia implicated in the detention of National Liberation Army commander-in-chief Abdul Fatah Younis in Brega's front on late July. Omar Mukhtar Brigade – Based in Ajdabiya and numbering 200 men and 10 trucks. Ali Hassan al-Jaber Brigade – Originally in Bayda, saw action during the Battle of Sirte (2011). Jabal Martyrs Brigade – Based in Bayda and numbering 125 men. Tripoli Martyrs Brigade – Based in Bayda. Battalion Libya Free – Based in Bayda. Bayda Martyrs Brigade – Based in Bayda. Martyrs of Abu Salim – Based in Bayda. Misrata Brigade – Based originally in Misrata, reported as based in Tripoli as of August 2011. Arise Brigade – Based on the Libyan Coastal Highway between Misrata and Tripoli. Tripoli Brigade – originally based in Nalut in the Nafusa Mountains and numbering 1,300 men. It is the elite of the rebel forces and was trained to take Tripoli, where it is currently based. Zintan Brigade – Fought for Sirte and during 2011 Nafusa Mountains Campaign. Kekka Brigade – Based in Tripoli and numbering 800 fighters. Lions of the Valley Brigade – Based in Misrata, fought in Sirte. 11th Brigade – Based in and fought in Sirte. Al-Ghiran Brigade – Based in Sirte and Misrata and was responsible for the capture of Muammar Gaddafi. Sabha Martyrs of Libya Brigade - Based near Sabha and claimed to be responsible for the capture of Abdullah Senussi. – Egypt has been reported to be supplying the rebels with mostly small arms such as assault rifles and ammunition. – France has acknowledged having sent arms to rebels in the Nafusa Mountains. These are rocket launcher, MILAN anti-tank missiles and guns and ammunition that have been sent. – The insurgents spokesman said on 6 May that NTC have reached an agreement with Italy to supply their troops with "equipment for self defense". – The Polish Press Agency reported that unofficially the Polish government supplied the rebels with anti-tank rocket launchers and military vehicles and officers of Polish Special Forces in direct operations. – Qatar has been reported to be supplying the rebels with various kinds of weapons including MILAN anti-tank systems and AK-47 rifles (as many as 400 such rifles have been estimated to have reached the rebels). Qatar has also supplied the rebels with camouflage and armored vests. – Sudan supplied fighters in the Nafusa Mountains, Misrata, Kufra, and Benghazi with supplies, ammunition, and weapons Such as FN-FAL and AK-47 assault rifles. – The United Arab Emirates had been reported to be supplying the rebels with Belgian FN-FAL rifles and telecommunication network. – The United Kingdom has supplied the rebel force with communication equipment and body armor in order to get the force more organised and define a central command structure. – The United States is moving to provide Libyan rebels with $25 million in medical supplies, radios and other aid that would not include weapons as stated by the Secretary of State Hillary Clinton. The equipment of the National Liberation Army comes primarily from abandoned Army depots, Libyan military defectors (notably in eastern Libya, Benghazi, Bayda, and Ajdabiya), Egyptian Armed Forces, France, Qatar and the United States. It is not exactly known what equipment is currently in use but reports from journalists reveal the following is in use (limited in some cases as in tank and armor because of unavailability of spare parts). Camouflage clothing has been provided by Qatar. Rebels have been seen in Ajdabiya wearing the military fatigues. T-34 - At least one seized during the war and placed at the main square in Garyan, according to Reuters. Current status unknown. BMP-3 Infantry fighting vehicle - 10 delivered from pre-revolution order. 9P157-2 "Khrizantema-S" BMP-3 Anti-tank version with supersonic 9M123 Khrizantema (AT-15) system with radar and laser guidance - 14 in service; 4 pre-revolution, 10 delivered in October 2013. Humvee - 200 donated by the U.S. Army in July 2013. MiG-21 Fighter jet aircraft – One MiG-21UM crashed after take-off from Benina airport due to technical malfunction. MiG-23 Fighter jet aircraft – one shot down by friendly fire over Benghazi. Note: Both the Soko G-2, and Mil Mi-2 were captured at Misrata Airport on 24 February 2011. ^ "Libya rebel army says training before Tripoli push". Reuters. 28 February 2011. ^ David D. Kirkpatrick and Karim Faheem (28 February 2011). "Libya rebels gain arms, defectors". Boston Globe. ^ "GADDAFI: Female bodyguards and repression but in the end he met brutal death". Daily Mail. UK. 21 October 2011. Retrieved 11 November 2011. ^ "Turkey to Train Libya's Army « Shabab Libya". Archived from the original on 29 November 2014. Retrieved 21 November 2014. ^ "Former Libyan rebels offered military jobs". The Daily Telegraph. London. 26 December 2011. ^ "Libya army chief of staff wants to disarm fighters". Zeenews. 5 January 2012. Retrieved 5 January 2012. ^ Libya’s Opposition Leadership Slowly Comes into Focus ... The Cutting Edge News, 21 March 2011. ^ Libya Rebel Recruits Head for Training as Insurgents Build Army by Ola Galal, Bloomberg Businessweek, 6 March 2011. Libyan rebel volunteers pour in by David Zucchino, Los Angeles Times, 3 March 2011. 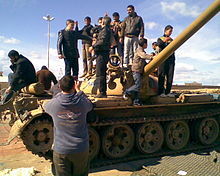 ^ Libyan rebels make efforts to rearm as fighting intensifies, msnbc.com, 7 March 2011. ^ Kirkpatrick, David D. (25 June 2011). "Rebels in Western Libya Loosen Qaddafi's Grip". The New York Times. ^ "Gaddafi forces recapture Ras Lanuf – Africa". Al Jazeera English. Retrieved 11 November 2011. ^ a b c d Evan Hill. "Libyan rebels get organised – Features". Al Jazeera English. Retrieved 11 November 2011. ^ ROOT TECHNOLOGIES – Hossam El-Kady (6 September 2011). "Pro-Gaddafi tribe disarmed near Sirte – The Egyptian Gazette". 213.158.162.45. Retrieved 11 November 2011. ^ "Libya rebels say Younis killers were 'Islamist element' | World news". The Guardian. UK. 30 July 2011. Retrieved 11 November 2011. ^ Gamal, Rania El (4 August 2011). "Analysis: Too many cooks spoil Libya's rebel front". Reuters. Retrieved 11 November 2011. ^ Gamal, Rania El (8 October 2011). "American fighter makes Libya's war his own | Reuters". In.reuters.com. Retrieved 11 November 2011. ^ a b The rebels handed over their weapons in Bayda(in Arabic). Binrabah ، 24 October 2011. ^ F_284 (24 October 2011). "تقرير إخباري: استقبال شعبي حافل في بنغازي للثوار المشاركين في تحرير سرت ووصول عدد من القادة لحضور إعلان التحرير". People's Daily. Retrieved 11 November 2011. ^ Nordland, Rod; Shane, Scott (24 April 2011). "Guantánamo Files: Libyan Detainee Now U.S. Ally of Sorts". The New York Times. ^ "Expat Pair Among Libyan Rebels Fighting For Zawiya |". Feb17.info. 13 July 2011. Archived from the original on 16 August 2011. Retrieved 11 November 2011. ^ Stephen, Chris (20 July 2011). "Libyan rebels push towards Zlitan". The Guardian. London. ^ Hopkins, Nick; Stephen, Chris (7 June 2011). "Libya rebels frustrated by Nato's safety-first strategy". The Guardian. London. ^ Logan, Joseph (8 October 2011). "Libyan city takes siege mentality to national stage". Reuters. Retrieved 11 November 2011. ^ a b Published on Fri 3 June 16:10:02 BST 2011. "Libya: Rebel brigade carry memory of leader's dead brother to frontline - News". Thescotsman.scotsman.com. Retrieved 11 November 2011. ^ "Ethnic cleansing, genocide and the Tawergha « Human rights investigations". Humanrightsinvestigations.org. 26 September 2011. Retrieved 11 November 2011. ^ "Rebels Forage for Munitions Ahead of Final Assault on Qaddafi Birthplace- Bloomberg". Mobile.bloomberg.com. 31 August 2011. Retrieved 11 November 2011. ^ "Misrata rebel forces seize arms after routing pro-Gaddafi troops |". Feb17.info. 31 July 2011. Archived from the original on 23 January 2013. Retrieved 11 November 2011. ^ "Irish Libyans join rebels trying to oust Gadafy – The Irish Times – Sat, August 13, 2011". The Irish Times. 13 August 2011. Retrieved 11 November 2011. ^ "Libyan rebels crack down on rogue militias « Shabab Libya". Shabablibya.org. 1 August 2011. Retrieved 11 November 2011. ^ "With the Sabratha Brigade in Libya". The Weekly Standard. 8 August 2011. Retrieved 11 November 2011. ^ "The Fight for Sabratha". The Weekly Standard. 16 August 2011. Retrieved 11 November 2011. ^ a b "NATO strikes kill ten freedom fighters following the liberation of Badr « Shabab Libya". Shabablibya.org. Retrieved 11 November 2011. ^ "Photo from Getty Images". Daylife.com. 6 October 2011. Archived from the original on 8 December 2011. Retrieved 11 November 2011. ^ "Libyan rebels say they have Gadhafi surrounded – CNN". CNN. 7 September 2011. Retrieved 11 November 2011. ^ "Libya's NTC claims control of Sabha". 21 September 2011. Retrieved 21 September 2011. ^ "Libya's NTC captures three southern towns". 22 September 2011. Retrieved 22 September 2011. ^ 5 Minutes 10 Minutes (3 October 2011). "Rule of law by militia as horrors are revealed". The Australian. Retrieved 11 November 2011. ^ Fadel Lamen (22 August 2011). "Libya News: Inside the Rebels' Secret Endgame". The Daily Beast. Retrieved 11 November 2011. ^ "Once allies against Gadhafi, now fight in new Libya". CNN. 5 October 2011. Retrieved 11 November 2011. ^ "Saif Gaddafi captured 'alive and uninjured' in Nessma claim Libyan officials". Daily Mail. UK. 23 October 2011. Retrieved 11 November 2011. ^ Farmer, Ben (12 October 2011). "Libya: Col Gaddafi's son Mutassim 'captured trying to flee Sirte'". London: Telegraph. Retrieved 11 November 2011. ^ "Libya's Gadhafi captured, killed | Newswatch | a Chron.com blog". Blog.chron.com. 20 October 2011. Retrieved 11 November 2011. ^ McElroy, Damien (22 October 2011). "No post-mortem for Gaddafi as debate over burial continues". London: Telegraph. Retrieved 11 November 2011. ^ Walker, Portia; Randall, David (20 November 2011). "Taken alive, Saif al-Islam Gaddafi escapes his father's fate". The Independent. London. ^ Spencer, Richard (20 November 2011). "Libya: conflict brewing over trial of Saif al-Islam Gaddafi". The Daily Telegraph. London. ^ Levinson, Charles (17 March 2011). "Egypt Said to Arm Libya Rebels". The Wall Street Journal. ^ Par Europe1.fr avec François Clémenceau (29 June 2011). "Libye : la France a armé les rebelles – Europe1.fr – International". Europe1.fr. Retrieved 11 November 2011. ^ "Libye: La France a parachuté des armes légčres aux rebelles libyens". 20 Minutes (in French). 30 June 2011. Retrieved 11 November 2011. ^ a b Jolly, David; Fahim, Kareem (29 June 2011). "France Admits Arming Libyan Rebels". The New York Times. ^ "Italy to supply Libyan rebels with arms: spokesman". Reuters. 7 May 2011. Retrieved 27 October 2011. ^ Staff (22 August 2011). "Poland Supplied Arms to Libyan Rebels?". Polish Radio External Service. Retrieved 25 August 2011. ^ Chivers, C. J. (20 April 2011). "Inferior Arms Hobble Rebels in Libya War". The New York Times. ^ "Wed, 26 Oct 2011, 18:19 GMT+3 – Libya". Al Jazeera Blogs. Retrieved 26 October 2011. ^ Carol Huang (21 July 2011). "Dubai telecoms engineers supply Libyan rebels with mobile phone network". The National. Retrieved 27 October 2011. ^ "Clinton recommends $25 million U.S. aid to Libyan rebels". Reuters. 20 April 2011. ^ "Coalition of the Ambivalent". The Wall Street Journal. 22 April 2011. ^ a b "An American Freedom Fighter in the Libyan Civil War: Part 3". SOFREP. Retrieved 21 November 2014. ^ a b "Dnevni list Danas - Biznis - Posao decenije vredan 100 miliona dolara". Retrieved 21 November 2014. ^ "Up Close With Mustafa Abud Al-Jeleil, Leader Of Libyan Rebels". World Crunch.com.com. Archived from the original on 3 April 2011. Retrieved 2011-03-12. ^ "Machine Gun M02 Coyote - 12.7x108 mm /.50 Browning". Retrieved 21 November 2014. ^ a b c Jonathan Marcus (10 March 2011). "Gaddafi loyalists mount onslaught". BBC. Retrieved 11 March 2011. ^ "Libyan Conflict - Photos and Videos - Page 240". Archived from the original on 29 November 2014. Retrieved 21 November 2014. ^ "U.K. diplomatic team leaves Libya". CBC News. 6 March 2011. ^ "Gadhafi asks Obama to end NATO bombing". CNN. 11 May 2011. ^ "Rebels Libyan attacks Bab Al Azizyia compound in Tripoli. - ETIENNE DE MALGLAIVE". Retrieved 21 November 2014. ^ John Moore. "Libyan rebels carry a Katyusha rocket to fire on government forces as... News Photo 109981268". Getty Images. Retrieved 21 November 2014. ^ "Libyan rebels receive foreign training". Retrieved 21 November 2014. ^ "Libyan Conflict – Photos and Videos – Page 259". Militaryphotos.net. Archived from the original on 9 February 2012. Retrieved 11 November 2011. ^ "Libyan Conflict – Photos and Videos – Page 257". Militaryphotos.net. 18 July 2011. Archived from the original on 9 February 2012. Retrieved 11 November 2011. ^ Chris Stephen (31 July 2011). "Misrata Rebels Seize Gaddafi Arms". The Guardian. UK. Retrieved 11 November 2011. ^ "Libya: Rebels fight street battles in Zawiya". BBC News. 19 August 2011. Retrieved 20 August 2011. ^ "Libyan Interim Forces Await Decision to Attack". English.alarabiya.net. 5 September 2011. Retrieved 11 November 2011. ^ Mandrake. "Esoteric Armour". Retrieved 21 November 2014. ^ "SA Ratels in Libya spur DA to call for investigation". Business Day Live. Retrieved 5 November 2014. ^ "Libyan Conflict - Photos and Videos - Page 307". Archived from the original on 29 November 2014. Retrieved 21 November 2014. ^ "Libya uprising: The battle on the road to Sirte". BBC News. 25 August 2011. Retrieved 26 August 2011. ^ "Libya unrest: Benghazi revels in freedom from Gaddafi". BBC News. 26 February 2011. ^ "CBC News: Canadian robot spy flies for Libyan rebels". 24 August 2011. Retrieved 21 November 2014. ^ Botti, David (25 February 2011). "Libya's Defectors". The New York Times. ^ "Media _DSC0117 – The Libyan Interim National Council". Ntclibya.org. 7 March 2011. Archived from the original on 6 November 2011. Retrieved 11 November 2011.